Home / Events / Women’s Health Matters! 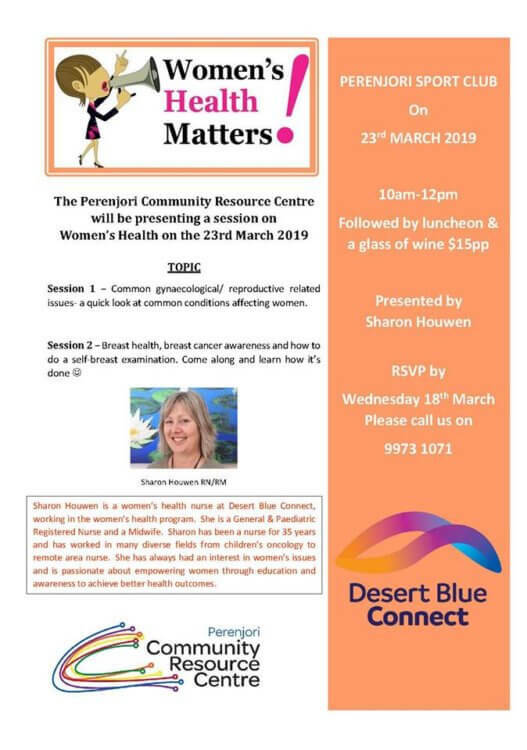 The Perenjori Community Resouce Centre will be presenting a session on Women’s health on the 23rd march 2019 at the Perenjori Sport Club. Sharon, Women’s Health nurse at Desert Blue Connect will talk on two topics for women – common gynaecological related issues and breast health, breast cancer awareness and how do do a self-breast examination. Don’t miss out on this yearly women’s event.